When your mornings consist of looking for an errant toddler shoe for 30 minutes and your nightly soundtrack is a chorus of But I’m not tiiired, then you can use a laugh. 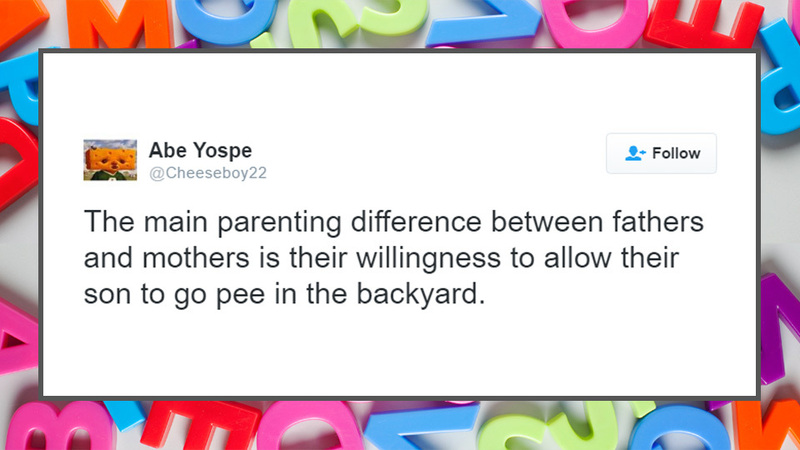 Here are this week’s funniest tweets from parents. Rest easy, moms and dads, knowing you’re not going at this crazy parenting thing alone — but Godspeed, friend. "I'm so glad I got here 20 minutes early" and other things toddler parents never say. Parents: name your kids things that are cool enough to be the name of a laser-tag team one day. Dongforce. Venom-Squadron. Murder Posse. I love it when my kids ask deep philosophical questions like, "Is it tomorrow now?" On the 7th day she rested. Just kidding. On the 7th day she did more laundry and cleaned the house. No one is as loud as the one who didn't put the kids to sleep. My family's mad I ate all the chocolate cake so I'm going to the store to buy more cake, little do they know imma eat all of this cake too. On your To-Do List for all eternity. The main parenting difference between fathers and mothers is their willingness to allow their son to go pee in the backyard. 4-year-old: How many tacos are there in the world? 4: That’s what I thought.